I stepped off a chartered civilian aircraft in Kuwait City and was bussed to one of our large bases in Kuwait. When I got to the base, I was told that I was heading to Iraq and was instructed to place my bags on a particular bus and prepare to leave to an air force base. In four hours, I was handed ammunition, threw on my body armor and was on a C-130 heading to the next chapter of my life: Iraq. Over the next six months, my Task Force, assembled with units from over three different states, accomplished one of the most difficult tasks in Operation Inherent Resolve: our nation’s war against ISIS. During this experience, we worked intimately with our coalition and Iraqi partners to accomplish tasks that continue to define the battle space. I came home just before Christmas to a relieved fiancée and family, and the transition began. A month later, I was sitting in Evidence classroom learning about Rule 403, but my mind was still in Iraq. It was difficult to reintegrate with my law school classmates, who were amazing throughout the process. As an old warrant officer explained to me, there are two phases of reintegration: 1) the honeymoon phase where you forget you ever left; and 2) the “real” phase where it creeps up again. As I reentered law school, phase two began. Through it all, I was blessed with an amazing and understanding fiancée and an incredible family. The decisions our military is called to make and the conditions we face are issues that most of our fellow Americans will never have to deal with or understand. But it is this difficult marathon that defines our nation’s wars. These are the decisions that we, as combat veterans, think about almost daily when we come home. And, my task force was blessed — everyone came home in our deployment. The camaraderie and brother/sisterhood formed during these times are unbreakable and last a lifetime. For me, seeing my deployment brothers and sisters at our Welcome Home Ceremony, held a few months after our actual date of coming home, was one of the most poignant moments of my life. Seeing their spouses, their children and the people who made them the special people they are is something that I will forever cherish. This network also extends beyond our unit to the larger legal community within both the military and military community support networks. Our veteran community is not just members of the JAG Corps; we are clerking at all levels of our judicial system and working at our state’s largest firms. Indeed, some of us are continuing our service in the National Guard and Reserves while pursuing our civilian occupations. We bring a unique skillset, a dedication and devotion to a mission, and a sense of maturity tied to global awareness. Taking care of our soldiers became my priority both as a young captain and in my civilian capacity. I have been in long enough to know that our soldiers are not always perfect, but I have also been in long enough to know that they are the best our nation has to offer, and they deserve only the best our nation can give. These soldiers are not only my motivation to serve, but they have changed the course of my career ambitions. They make our nation exceptional. Since returning from Iraq, my focus has shifted to exploring how I can best serve our veteran community. The combination of my legal background and military experience has allowed me to understand the severity of the legal challenges veterans face when they return home. This is a challenge that our judicial system has just begun to address with the creation of Veterans Trauma Courts (VTC). There is a lot of nuanced literature on the growth of VTC; my intent is merely to advocate for their establishment and continued proliferation. It is the least our judicial system can do for those we asked so much from. 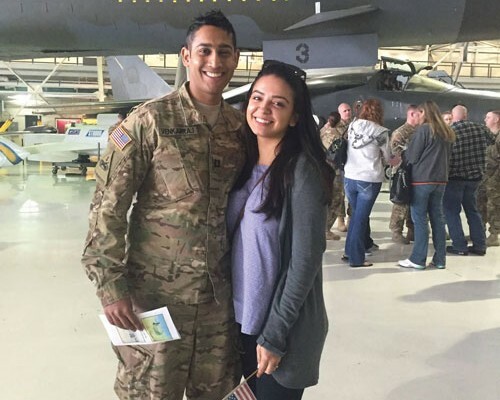 Karthik Venkatraj is a captain in the Colorado Army National Guard and completed a six-month tour in Iraq in support of Operation Inherent Resolve, our nation’s war against ISIS. He is president of the Military Law Society and was co-managing editor of the University of Colorado Law Review. He was recently elected president of the Student Bar Association at the University of Colorado Law School. He will summer at Brownstein Hyatt Farber Schreck LLP. He can be reached at kave7403@colorado.edu.